ABS-CBN's heavy drama TV series "Dahil Sa Pag-Ibig" is about to wrap up this Friday! An explosive ending is about to happen us secrets and mysteries behind each characters were revealed! 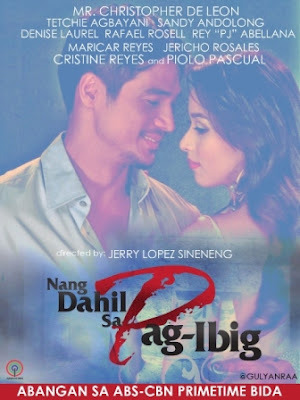 Now that Father Alfred Valderama (Piolo Pascual) regained his past childhood memories and learned that Leo Valderama (Christopher De Leon) who adopted him was the man behind the tragic deaths of his parents, will he set vengeance for him as a payment for all the evil deeds he had done to his real family?! How will he reconcile to his long lost brother Oliver (Jericho Rosales)? Will he join Oliver to fight back against Leo? In the romantic side of the story, will still be Jasmine (Cristine Reyes) and Alfred in the end?! How will the truth change the relationship of Jasmine and Alfred?! How about Agnes (Maricar Reyes) and Oliver?! "Dahil Sa Pag-Ibig" is another successful product of ABS-CBN's leading Primetime Bida! It is an in-depth teleserye as the story revolves in the important aspects of society like politics, family, and religion! It is not only a romance TV series we all used to grow up with!